Welcome to the third post in the Summer Branding Series! 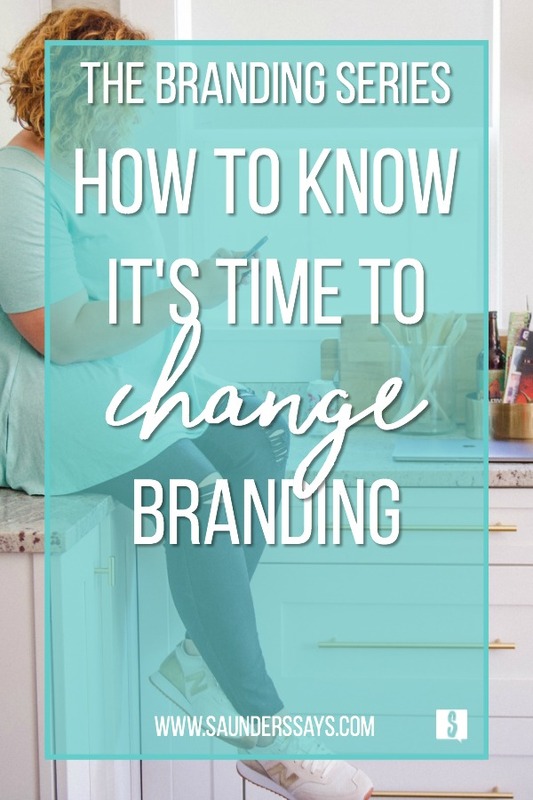 This week, guest blogger Holly Peck from The Holly Peck shares how to know it’s time to change branding. You can find the previous posts here: Part 1: Why Do I Need A Personal Brand and Part 2: Creating An Authentic Brand! Enjoy! When I launched my blog in the summer of 2017, I had branding that I was excited about: a look, feel, and vibe to my blog that fit me and my purpose. It made sense; it all fit together like peanut butter and jelly. My branding was magical, until one day, it just wasn’t. I knew that it was time to change branding. Spring 2018 brought a lot of change: I had shifted businesses and my focus for my blog, so it was the perfect time for me to work with Nicole and become one of her premium branding clients. I went through the full rebrand, complete with logo, alternate logos, submarks, business cards, and the whole shebang. However, this begs the question: how do you know it’s time for a rebrand? Here are three things to consider if you’re wondering if it’s time to change your branding. I knew that it was time to change my brand because my overall blogging focus had changed. Instead of being a fashion and lifestyle blog for a specific clothing brand, my blog has a new purpose. Yes, I will blog about nail care and the direct sales brand that I represent, but my overall purpose is to leverage my blog to dig into affiliate marketing. My previous branding, while perfectly lovely, was for a niche focus no longer relevant to my current efforts. A logo of a dress used for nail care and health no longer captures the feeling and the vibe desired. Your branding and your logo should generally match your focus – if you’re a beauty blogger, your logo should evoke feelings of beauty. A style blogger – it should match the style vibe you’re looking to convey. When your logo and vibe doesn’t match your blog focus, it might be time to change branding. Your blog is a reflection of you. It is a time investment, an emotional investment, and a physical investment. Branding should reflect you; it should evoke an emotional response from you. When Nicole sent me my first draft of my logo, I cried. Not sad tears, but happy tears because she had captured completely what I was hoping to have reflected in my branding. Since I had changed to something new, I had lost a bit of myself in that interim, and she captured it. It reflected my perceptions of myself, and what I wanted to bring to others. Every single time I see my logo, I smile. It makes me feel joy. Disclaimer: There’s a huge difference between boredom and lack of emotion. Don’t simply change up your brand because you’re bored. Blogging is a long-term commitment, not something that gets changed up on a whim. Rebranding and changing is strategic and targeted, not because you simply woke up one day and decided to change. This may sound a little bit silly, but behind every brand and every logo, I see a small bit of the person behind it peeking through. The colors and font choices capture emotions and inclinations, the patterns and colors are part of their personality and their vibe. Beginners don’t often “get” their personality in their branding – the reality is that blogging is an upward climb; a learning experience all the way. Many beginners pick a theme and pull together a logo, and later learn that it’s not quite a reflection of themselves anymore. In the blogging world, authenticity is key. Readers know when a blogger isn’t being true to themselves – authenticity rings true. If you are thinking about changing your branding, make sure to head over to Nicole’s Work With Me page! And tell me, what are your reasons for changing up your branding? Ready to change your branding? Head over to Nicole’s Client Intake Form now! She only works with two branding clients a month and her calendar fills up fast!